Max McCormick scores his lone NHL goal. Credit: Matt Marton, USA TODAY Sports. 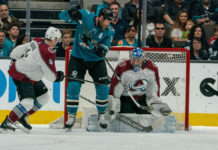 The Avs may be reeling — losing 18 of their last 23 games — but they’re still fighting. According to NHL.com, the Colorado Avalanche sent forward J.C. Beaudin to the Ottawa Senators for their forward Max McCormick on Wednesday morning. 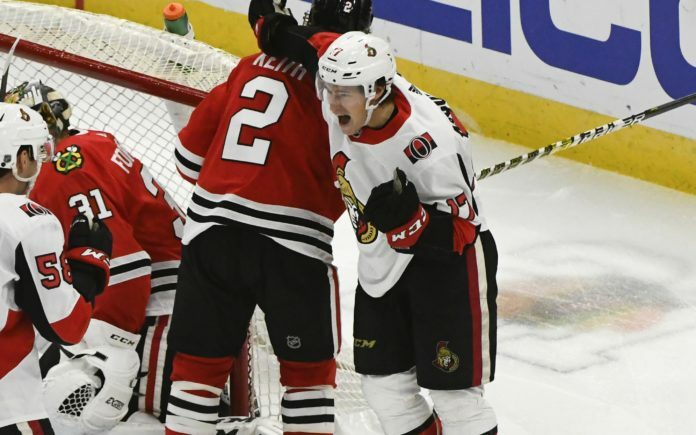 McCormick, who’s 26 years old, has played a vast majority of his career with the Senators’ American Hockey League affiliate, the Belleville Senators, since being selected in the sixth round of the 2011 NHL draft. McCormick has played 253 games in the AHL, racking up 61 goals and 64 assists, including 19 games this year (7g, 5a). He’s also played 14 games with the NHL Senators this season, notching one goal. Prior to his NHL and AHL careers, McCormick played for the United States Hockey League’s Sioux City Musketeers, racking up 42 points (21g, 21a). He then went onto play three years of college hockey with Ohio State, totaling 88 points in his college career (36g, 52a) in 104 games. The move sends away Beaudin, one of the team’s Top 25 under 25 per Mile High Hockey. 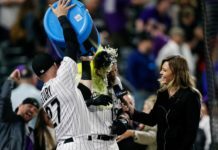 The 6’1″ center split last season with the San Antonio Rampage of the AHL (34 games, 2g, 5a) and the Colorado Eagles of the ECHL (30 games, 7g, 20a). This year, he played 42 games with the Eagles — who have moved up to the AHL — scoring six goals with seven assists. McCormick, who’s 5’11” and plays on the left wing, will be sent to Loveland, Colo. to join the Eagles, as the deal is for young prospects. On Thursday, the Avalanche look to snap a four-game losing streak as they face the Capitols in Washington with a 5 p.m. MT puck drop. 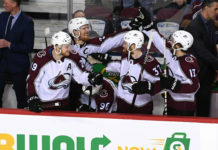 With 52 points, the Avalanche are currently 10th in the Western Conference, looking to rebound from recent losses and find their way back into the playoff hunt.